There's no stopping this hot-headed monster as he swings the awesome Flame Wreck hammer — then slams it down to create a ring of fire around the enemy! Ultimate Flama is full of tricks too, with the slime stud shooter and icy water to soak the enemy. Upgrade your battle skills by scanning shields to obtain 3 NEXO Powers for your digital collection of unique abilities to outsmart your enemies in the free LEGO® NEXO KNIGHTS™: MERLOK 2.0 app. Scan for 3 NEXO Powers: Flame Wreck, Slime Blast and Ice Dragon. The Ultimate Flama (70339) Lego set is available from the sites below. However, they do not offer delivery to your selected region. The Ultimate Flama (70339) Lego set is no longer directly available from the sites below. However, 3rd party partners of these sites might still have the set available. 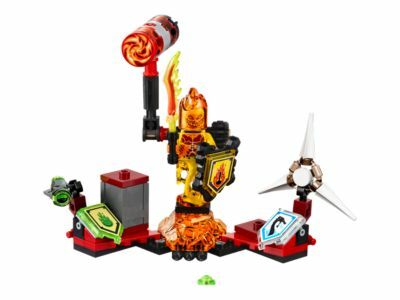 Alternate description Ultimate Flama is hot on the knights' heels with a movable hammer and slime stud shooter, plus 3 scannable shields and a minifigure. Includes an Ultimate Flama minifigure. Ultimate Flama merges live-action play with 3 scannable shields to obtain unique NEXO Powers for digital gaming. Weapons include a sword, hammer, slime stud shooter and a spinning ice disc. Accessory elements include a shield, 3 extra studs for the slime stud shooter and a showcase stand. Turn the wheel to activate the swinging hammer function. Fire a slime element into the air with the stud shooter. Scan shields for each of the 3 NEXO Powers (Flame Wreck, Slime Blast and Ice Dragon) and power up in the LEGO® NEXO KNIGHTS™ game. Collect and combine all the Ultimate LEGO® NEXO KNIGHTS™ sets to boost your collection of ultimate battle gear.